Conquer the Ancient Greek World! Experience every facet of war. Campaign across a continuous satellite-accurate map of ancient Greece encountering the full range of warefare from reconnaissance to raids to field battles to mountain blockades. Steeped in History! 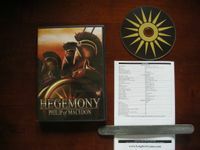 In-game pedia and 100+ historical objectives recreate the rise of the Macedonian empire. Innovative Supply system! Siege and starve the enemy by cutting their supply lines or burning their crops, all the while building and protecting your own supply network to support your empire.